This young woman of African-American origin wanted to have subtle improvements in her nose. She was interested in having a nose which fit her face and her unique look naturally. A natural appearance is the appearance we seek to give all of our patients. 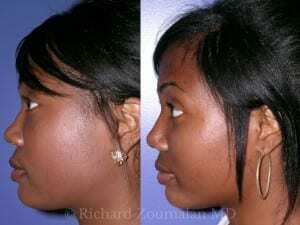 You can see improvement in her dorsum (bump) on the after images. 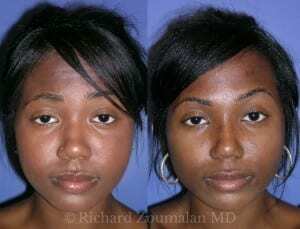 Dr. Zoumalan performs Rhinoplasty’s on African-Americans in a way to retain identity and fit one’s face.